Volunteers arrive to serve, filled with passion and excitement . . . but what got them there at the outset, may not be what brings them back. That initial passion may evolve over time, or it may even wane. The good news is, it doesn’t have to. Leaders can make a difference. Leaders of volunteers can take a number of proactive steps to sustain the engagement of those who choose to serve through their organization. Doing so requires a bit of knowledge, a bit of discipline, and a lot of desire--the desire to continue to feed the passion-fires of volunteers. Preparing a volunteer from the beginning of their time of service hastens the journey from vulnerable, new volunteer to competent, confident, returning volunteer. 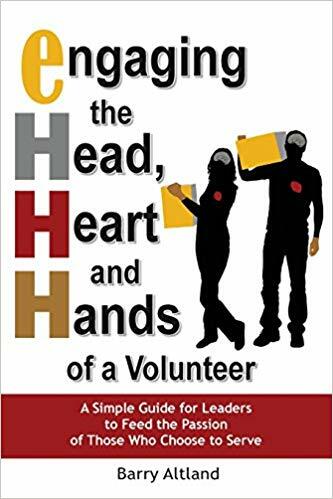 A critical step in this preparation is something the book, “Engaging the Head, Heart and Hands of a Volunteer,” refers to as Discovery. Discovery is simply asking the question “Why do you choose to serve as a volunteer?” When volunteers are asked what they gain from offering their time and talents, most can quickly describe what they receive that feeds their passion. People have an innate sense for what encourages their continued volunteer service. They can also recognize the inhibitors that are discouraging for them. Why should a leader of volunteers seek to discover these intrinsic motivators? Unlocking what is in the heart of a volunteer is the key to aligning their service to their passion points. Helping a volunteer land in a role that meets their needs, wants and desires is the essence of volunteer engagement. This cannot be accomplished without first learning what stirs in the hearts of those who choose to serve. Most of us desire to know how we are doing in our work. Words of affirmation from a leader can be powerful. Words of gentle guidance and redirection can also increase the volunteer’s self-esteem and sense of contribution. Leaders must be present among their volunteers, ready to “catch them in the act” of doing something great. When they see it, they say it! The timely “I noticed that . . .” message woven into the service day can leave a profound impact on the engagement level of a volunteer. Noticing others’ work matters. For a volunteer, knowing their work is noticed by the others, matters. Just as leaders spread the sunshine of feedback with volunteers, they seek to build upon the informal, on-the-spot interactions with more structured opportunities for deeper conversation. Leaders know that being there to support volunteers, especially those who have demonstrated a continuing commitment, requires an ongoing investment. Coaching is a relationship-building practice with increasing presence in volunteer-supported organizations. Why are more organizations adopting these practices? Because the correlation between volunteers’ sustained emotional connection to the organization, its leaders and their peers and their continued impassioned service is undeniable. Coaching feeds the passion of the volunteer. What exactly is Coaching? The terms coach and coaching have been used in a variety of contexts, from transportation and sports to executive development and discipline. Because of their myriad use in many environments, the concept of Coaching within an organization can be confusing. Hence, a formal definition. Coaching as a leadership practice is defined as conducting regularly scheduled one-on-one discussions between the leader and the volunteer that are focused on performance and development. By asking lots of open-ended questions in these Coaching conversations, encouraging open dialogue, and allowing others to provide input on choices and decisions, whenever possible, volunteers feel like they are more than “free labor.” They instead feel they are a meaningful part of shaping the future. Leaders of volunteers must consider a simple truth when it comes to recognizing others’ performance: one size does not fit all. Each volunteer has a unique set of preferences for being recognized. These preferred ways of receiving recognition are intimately connected with the intrinsic drivers that compel the volunteer to serve in the first place. Wow, that sounds complex. And, yes, it can be. So, let’s break this down to a simpler approach. First, do not throw out a current recognition program, if one is in place. Just acknowledge its limitations. Any program will only meet some desires for acknowledgement, some of the time. Second, to gain insight on what will have meaning to an individual, just ask them. Most of us are in tune with our likes and preferences in this area . . . or at least what we do not like. Then, tailor recognition to the preferred style of the recipient. A heartfelt thank you may be all that person wanted, and needed—no coffee mug or certificate required. When leaders of volunteers can discover, notice, coach and acknowledge those in their charge, only then can the passion-fires of volunteers continue to be fed. With the right mix of knowledge, discipline and desire, leaders can sustain the passions of volunteers for many years of meaningful service. See Barry’s Interview on the “Let’s Talk NonProfits” TV show.